Members of United Steel Products Preventive Maintenance plans can save substantial time and money by reducing costly breakdowns and loss of time, while extending the operating life and efficiency of all doors, operators, and dock equipment. By becoming a member you are able to expect the below services with your security grilles, rolling doors, high speed doors, and many of our other products. 24 Hour 7 Day a week emergency service. Increased operational efficiency and reliability of your facility’s doors, docks, and related equipment. Reduced probability of your doors, operators, and dock equipment malfunctioning. Extended safe and useful life of your doors, operators, and dock equipment. Each service call includes a written checklist of work performed, along with recommendations for any needed repairs or product replacement. Doors of all types, electric operators, and all dock equipment may be included under this PM Program. 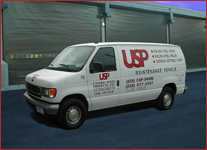 In addition, USP offers professional PM service on high speed doors, impact doors, chain and scissor gates, and related type commercial, industrial and/or institutional doors and openings. Each PM Program can be individually designed for your facility’s specific doors, operators, and dock equipment. Enrollment in the Preventive Maintenance Program is FREE. Member benefits begin with your first scheduled PM service call. You pay only for the discounted labor used to perform the preventive maintenance work along with any repair parts that are used per your authorization. For more information contact our service department by calling (833) 387-6591.